When we got our hands on Acer’s initial C7 Chromebook, our chief gripe was its frankly disappointing 4-hour battery life. We now know that Acer had its ear to the ground after launch. It’s rolling out a new trim level, the C710-2055, that mends the short runtime and beyond. The new edition carries a 6-cell battery that should give it six hours of battery life — still not as good as the 6.5 hours of Samsung’s ARM-based Chromebook, but it’s at least in the ballpark. Performance should also get a useful kick in the pants now that Acer has doubled the RAM to 4GB. While the upgrades take the newly available C7’s price slightly out of impulse purchase range, to $280, it’s now a more viable option for those who need more grunt than ARM can currently deliver without venturing into Chromebook Pixel territory. 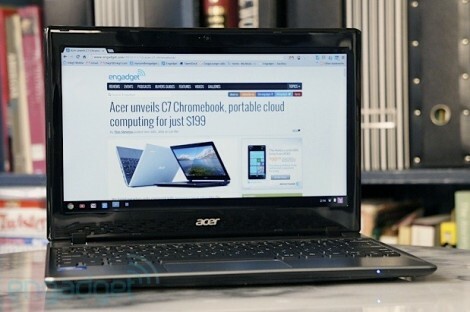 SAN JOSE, Calif., (March 12, 2013) – Acer America today debuts new Acer C7 Chromebook models for its commercial customers, especially schools looking for a way to enhance student learning with technology that is affordable and impactful. Teachers and parents will appreciate that the Acer C7 Chromebook is automatically updated, so their students have the latest software version and protection against online threats. The Chrome OS has security features built in to defend against malware and viruses to further ensure students’ online safety. Also, the available web-based management console lets administrators set up and manage users, apps and policies across all Chromebooks in the network, reducing the need to travel to separate classrooms. In addition, the Acer C7 Chromebook is an excellent choice for schools considering a 1-to-1 computing initiative. IT administrators will be pleased with both the affordable price of the Chromebook as well as the reduced cost of maintenance and support. The robust features and capabilities in Google Apps for Education mean there is no additional required investment in expensive software. Students can also use Chrome Web Store Apps to find additional educational apps for enhanced learning. The Acer C7 line is ideal for schools planning to give multiple students access to the Chromebooks, either in their classrooms or on a mobile cart. Each student can log on with their unique account to access email, documents, website bookmarks and other projects. Chromebooks come with Google Drive, an online file storage service, so students and teachers can save and access their files safely online and won’t need to back up manually. Teachers and students can also access files as well as create and edit Google Docs and use Gmail offline for greater flexibility. With Google Docs, it’s easy to share and collaborate on school projects such as presentations and reports that incorporate input from several students. Students in middle school and high school can also see calendars set up by the teacher to track homework, assignments, and projects in various classes. The Acer C7 Chromebooks quickly connect to campus wireless networks with integrated 802.11b/g/n WiFi, so they can be used in a dedicated classroom or on a mobile cart. Students can take advantage of the many educational websites and Chrome apps available online for enhanced learning. Students will also be able to get right to work with the Acer C7; it boasts a less-than 18-second boot time and can almost instantly resume from sleep mode. Plus, using Chrome is easy and intuitive for students and teachers alike. The new Acer C710-2055 Chromebook for customers in the U.S. is powered by a 6-cell battery that delivers up to six hours of life for all-day student learning without having to recharge during school hours. (1) It is powered by an Intel Celeron 847 processor (2MB L3 cache, 1.10GHz, DDR3 1333 MHz) and 4GB of RAM to provide exceptional speed and responsiveness when running multiple apps and programs. The Acer C7 weighs only 3.05 pounds, so it’s portable enough to move between classrooms and even outside for projects in classes such as science and art. It measures only one inch thin, so it can easily be stored in a classroom, on a mobile cart, or can fit into a backpack for schools that allow a check-out program. The slim size incorporates a full-sized keyboard that is comfortable to use for web browsing, creating presentations and running educational apps. Multimedia can be incorporated into student learning with the Acer C7’s integrated HD 1.3MP webcam. Video and photos can be captured and incorporated into presentations, websites and slideshows. Plus, the Acer C7 has three USB 2.0 ports, so it can be connected to a digital camera and other devices. It also has an HDMI port for sharing video and content to external displays for a presentation. Students can easily view websites, apps, video and more on the C7’s 11.6-inch HD Widescreen CineCrystalTM LED-backlit LCD. The new Acer C710-2055 is available now in the U.S. at retailers and from authorized Acer resellers for $279.99. Additional configurations are available in the Acer C7 Chromebook line. 1.) Actual battery life varies depending on product specifications, computer settings and applications or features launched. All batteries’ maximum capacity diminishes with time and use. 2.) Limited warranties and service agreements apply. May not be available in all locations. Availability varies. Other conditions apply. For a copy, write to Acer Customer Service, P.O. Box 6137, Temple, TX 76503.